Blueberry is the common name for flowering plants in the genus Vaccinium, sect. Cyanococcus of the heath family Ericaceae, characterized by bell-shaped or tubular flowers and fruit that is a blue to black "false berry." The name also is used for the edible fruit of these plants. Several other plants of the genus Vaccinium also produce blue berries which are sometimes confused with blueberries, mainly the predominantly European bilberry (Vaccinium myrtillus), which in many languages has a name that means "blueberry" in English. (See the Identification section for more information.) "Huckleberry" sometimes is a term that is used interchangeably with blueberry in some areas, but it is botanically distinct. The huckleberry, in the genus Gaylussacia, has a blue-black berry that closely resembles the blueberry, but the huckleberry has ten small, hard seeds in the center, whereas the blueberry has many seeds, which are so tiny and soft as to be barely noticeable (Herbst 2001). The blueberry fruit, which is tied to the species' individual need for reproduction, at the same time fulfills a larger functional need for both the ecosystem and humans by providing nutritious food for birds, bears, and people. (See Culinary uses and health benefits.) Furthermore, blueberries' pleasing taste, texture, and color add to the human enjoyment of nature. And further reflecting the harmony in nature, the blueberry flowers provide a nectar source for bees, while at the same time the bees act as agents of pollination for the blueberry plants. Health research in recent years has shown that blueberries comprise a particularly healthful blend of fiber, antioxidants, vitamins, and minerals. The blueberry belongs to the Ericaceae family of flowering plants. Also called the heath family or ericaceous plants, members of this family are mostly lime-hating or calcifuge plants that thrive in acid soils. The Ericaceae family consists of herbs, shrubs, and trees with leaves that are alternate, simple, and estipulate (lacking a modified leaf at the base of each leaf). Plants in this family are synoecious with distinct male and female flowers present in the same cluster of flowers. 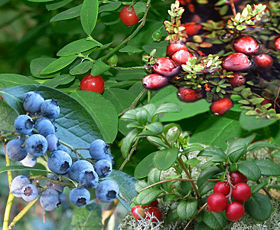 In addition to the blueberry, other well-known members of the family include the cranberry, heath, heather, huckleberry, azalea, and rhododendron. The Vaccinium genus to which the blueberry belongs contains about 450 species, which are found mostly in the cooler areas of the Northern Hemisphere, although there are tropical species from as widely separated areas as Madagascar and Hawai'i. Well-known members of the genus include the cranberry, bilberry or whortleberry, and cowberry or lingonberry,. The plants prefer heath landscapes, as well as open forests. Species whose English common names include "blueberry" typically are classified in section Cyanococcus of the subgenus Vaccinium. Blueberry species are native only to North America. They are shrubs varying in size from low-growing plants, ten centimeters tall, to large shrubs, four to five meters in height. The smaller species are known as "lowbush blueberries," and the larger species as "highbush blueberries." The leaves can be either deciduous or evergreen, ovate to lanceolate, and from 1-8 centimeters long and 0.5-3.5 centimeters broad. The flowers are bell-shaped, white, pale pink or red, sometimes tinged greenish. The blueberry and its cousins each carry the sepals of their flower at the tip, showing that the berry forms below that flower. The fruit is a false berry 5-16 millimeters in diameter with a flared "crown" at the end. In botany, a "true berry" is a fleshy or pulpy indehiscent fruit in which the entire ovary wall ripens into a relatively soft pericarp, and the seeds are embedded in the common flesh of the ovary. A "false berry" or "epigynous berry" is an accessory fruit found in certain plant species with an inferior ovary, whereby other parts of the flower (including the basal parts of the sepals, petals, and stamens) can ripen along with the ovary, forming the false berry. The blueberry fruits are round and contain many tiny seeds. The fruits, which are often clustered, are pale greenish at first, then reddish-purple, and finally indigo on ripening. They have a sweet taste when mature, with variable acidity. Blueberry bushes typically bear fruit from May through October in the Northern Hemisphere. Although blueberries are native to North America, they are now grown also in the Southern Hemisphere in Australia, New Zealand, and South American countries, and are air-shipped as fresh produce to markets around the world (USHBC 2002). True wild blueberries (section Cyanococcus of the genus Vaccinium) occur naturally only in eastern and north-central North America. Other sections in the genus, native to other parts of the world, including western North America, Europe, and Asia, include other wild shrubs producing similar-looking edible berries such as huckleberries, cranberries, bilberries, and cowberries. These are sometimes colloquially called blueberries and sold as blueberry jam or other products. The names of blue berries in languages other than English often translate as "blueberry," e.g. Scots Blaeberry and Norwegian Blåbær, although those berries may belong to another species. For example, Blåbær and French myrtilles usually refer to the European native bilberry, while bleuets refers to the North American blueberry. Aside from location of origin, blueberries can be distinguished from bilberries by cutting them in half. Ripe blueberries have white or greenish flesh, while bilberries and huckleberries are colored purple throughout. Huckleberries also are distinguished by having a thicker skin and a flavor that is more astringent and slightly less sweet (Herbst 2001). More definitively, huckleberries have 10 small, hard seeds in the center, while blueberries have many soft and tiny, barely noticeable seeds. Blueberries are both cultivated and picked wild. In North America, the most often cultivated and economically important species is V. corymbosum, the northern highbush blueberry. Hybrids of this with other Vaccinium species adapted to southern United States climates are known collectively as southern highbush blueberries. Another extensively cultivate species is V. augustifolium (sny. V. pennsylvanicum), the lowbush blueberry. Wild blueberries, smaller than cultivated ones, are prized for their intense color. 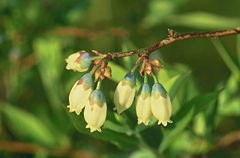 The lowbush blueberry, V. angustifolium, is found from Newfoundland westward and southward to Michigan and West Virginia. In some areas, it produces natural blueberry barrens, where it is practically the only species covering large areas. Several First Nations communities in Ontario are involved in harvesting wild blueberries. Lowbush species are fire-tolerant and blueberry production often increases following a forest fire as the plants regenerate rapidly and benefit from removal of competing vegetation. 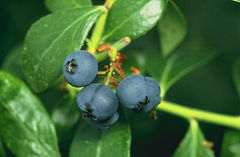 There are numerous highbush cultivars of blueberries, with unique and diverse flavors. The most important blueberry breeding program has been the USDA-ARS breeding program based at Beltsville, Maryland, and Chatsworth, New Jersey. This program began when Dr. Frederick Coville of the USDA-ARS collaborated with Ms. Elizabeth White. In the early part of the twentieth century, Ms. White offered wild pickers cash for large fruited blueberry plants. 'Rubel', one such wild blueberry cultivar, is the origin of many of the current hybrid cultivars. Other important species in North America include V. pallidum, the Hillside or Dryland Blueberry. It is native to the eastern United States, but common in the Appalachians and the Piedmont of the Southeast. Sparkleberry, V. arboreum, is a common wild species on sandy soils in the southeastern United States Its fruits are important to wildlife, and the flowers important to beekeepers. Blueberries were first cultivated in the United States by Elizabeth Coleman White in the southern New Jersey village of Whitesbog (NJDEP). Maine produces 25 percent of all blueberries in North America, making it the largest producer in the world. Maine's 24,291 hectares (60,023 acres) of blueberry were propagated from native plants that occur naturally in the understorey of its coastal forests (Stubbs and Drummond). The Maine crop requires about 50,000 beehives for pollination, with most of the hives being trucked in from other states for that purpose (Stubbs and Drummond). Many towns in Maine lay claim to being the blueberry capital and several festivals are centered around the blueberry. The wild blueberry is the official fruit of Maine and is often as much a symbol of Maine as the lobster. Quebec has the largest quantity of wild blueberry production, coming especially from the regions of Saguenay-Lac-Saint-Jean and Côte-Nord, which provide 40 percent of Quebec's total provincial production. Nova Scotia also is a major producer of wild blueberries. Significant production of highbush blueberries occurs in Oregon, Washington, British Columbia, Michigan, New Jersey, and North Carolina. California is rapidly increasing plantings of southern highbush varieties originating from the University of Florida and North Carolina State University. Southern highbush berries are now also cultivated in the Mediterranean regions of Europe. Highbush blueberries were first introduced to Germany and the Netherlands in the 1930s and have since been spread to Poland, Italy, and other countries of Europe, with a blueberry industry developing in many of those regions of Europe where production is possible (Nauman 1993). . In the Southern hemisphere, Chile, Argentina, Uruguay, New Zealand, and Australia now export blueberries. South Africa exports them to Europe. Blueberries were first introduced to Australia in the 1950s, but the effort initially was unsuccessful; a subsequent selection later led to success (Clayton-Greene 2007). 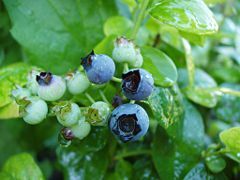 By the early 1980s, the blueberry industry was started in New Zealand and is still growing (BNZ 2007). The industry is even newer in Argentina, with only 400 hectares in 2001, increasing by 400 percent to 1,600 hectares by 2004, according to a 2005 report by the U.S. Department of Agriculture (Gain 2005). Chile is the biggest producer in South America and the largest exporter to the northern hemisphere, with an estimated surface of 6,800 hectares as of 2007. Introduction of the first plants started in the early 1980s and production started in the late 1980s in the southern part of the country. Today production ranges from Copiapó in the north to Puerto Montt in the south, which allows the country to offer blueberries from October through late March. Production has evolved rapidly in the last decade, becoming the fourth most important fruit exported in value terms. Fresh market blueberries are exported mainly to North America (80 percent) followed by Europe (18 percent) Chile exported in 2007 more than 21 thousand MT of fresh blueberries and more than 1,000 MT of frozen product (ASOEX 2007; Fedefruta 2007). 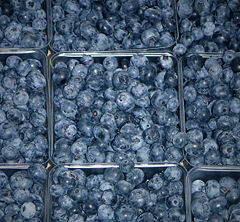 Blueberry production in North America typically starts in mid-May (in Florida) and ends in September, when some fruit is held over in controlled-atmosphere storage in Oregon, Washington, and Canada (Gaskell 2006). Sources give different periods for the growing season in the southern hemisphere. According to the University of California Extension Service, Chile, New Zealand, and Argentina begin harvesting in what is the winter in the Northern Hemisphere and continue till mid-March, when Chilean blueberries are held over in controlled-atmosphere storage for about six weeks. "As a result, blueberries reach annual peak prices in mid-April" (Gaskell 2006). San Jose Farms in Chile, which claims it is one of the oldest blueberry producers in the country, having started in the early 1990s, states that its harvest season starts in November and continues through March (San Jose Farms, no date). In Argentina, blueberry marketing begins in September and ends in February (Gain 2005). Blueberries are sold fresh or processed as individually quick frozen (IQF) fruit, purée, juice, or dried or infused berries. The berries may in turn may be used in a variety of consumer goods such as jellies, jams, pies, muffins, snack foods, and cereals. Blueberry jam is made from blueberries, sugar, water, and fruit pectin. Usually made from wild blueberries, premium blueberry jam is common in Maine, Ontario, Quebec, and British Columbia. Beginning around 2003, pure or blended blueberry juice has become a popular product in Canada and the United States. Blueberries, especially wild species, contain anthocyanins, other antioxidant pigmentsm and other phytochemicals, which may have a role in reducing the risks of some diseases (Gross 2007a), including cancers (NCI 2004; CRS 2006; Seeram et al. 2006; Neto 2007). Researchers have shown that blueberry anthocyanins, proanthocyanidins, flavonols, and tannins inhibit mechanisms of cancer cell development in vitro (Srivastava et al. 2007; Schmidt et al. 2006; Yi et al. 2005). A 2007 symposium on berry health benefits included reports showing consumption of blueberries (and similar fruits including cranberries) may alleviate the cognitive decline occurring in Alzheimer's Disease and other conditions of aging (Gross 2007a). Feeding blueberries to animals lowers stroke damage (Sweeney et al. 2002; Wang et al. 2005). Research at Rutgers at the Philip E. Marucci Center for Blueberry & Cranberry Research & Extension has also shown that blueberries may help prevent urinary tract infections. Other animal studies found that blueberry consumption lowered cholesterol and total blood lipid levels, possibly affecting symptoms of heart disease (DeNoon 2004). Additional research showed that blueberry consumption in rats altered glycosaminoglycans, vascular cell components that can influence control of blood pressure (Kalea et al. 2006). Most of these studies were conducted using highbush, hybrid cultivars of blueberries. Content of polyphenol antioxidants and anthocyanins in lowbush blueberries exceeds the values found in highbush blueberries (Kalt et al. 2001). One cup (145 gram) of blueberries provides 31 percent of the Dietary Reference Intake for vitamin C, 16 percent for dietary fiber, 20 percent for manganese, and 7 percent for vitamin E (GMF 2008), with a low glycemic load (ND). Beginning in 2005, blueberries have been discussed among a category of functional foods called superfruits having the favorable combination of nutrient richness, antioxidant strength, emerging research evidence for health benefits (Gross 2007a) and versatility for manufacturing popular consumer products (Starling 2007; Gross 2007b). ↑ Philip E. Marucci Center for Blueberry & Cranberry Research & Extension, Rutgers, The State University. Retrieved May 1, 2008. Asociación de Exportadores de Chile (ASOEX). 2007. ASOEX. La Asociación de Exportadores de Chile A.G.. Retrieved April 14, 2008. Blueberries New Zealand (BNZ). 2007. Good things come out of the blue. Blueberries New Zealand. Retrieved December 2, 2007. Cancer Research Society (CRS). 2006. Antiangiogenic and antitumour properties of dietary-derived anthocyanidins: A study led by Richard Béliveau, Ph.D.. Cancer Research Society. Retrieved April 14, 2008. Clayton-Greene, K. 2007. The blueberry industry in Australia: An overview. International Society for Horticultural Science Acta Horticulturae. Retrieved December 2, 2007. DeNoon, D. J. 2004. Blueberries may lower blood fat/cholesterol: Tasty berries carry fat-fighting compound. WebMD Medical News. Retrieved April 14, 2008. Federacion de Productores de Frutas de Chile (Fedefruta). 2007. Chilean Fruit Producers Federation. Federacion de Productores de Frutas de Chile. Retrieved April 14, 2008. Gaskell, M. 2006. Strategies for off-season blueberry production on coastal California small farms. Central Coast Agriculture Highlights February 26. Retrieved April 14, 2008. George Mateljan Foundation (GMF). 2008. Blueberries. World's Healthiest Foods. Retieved April 14, 2008. Global Agriculture Information Network (Gain). 2005. Argentina blueberries. USDA Foreign Agricultural Service: GAIN Report AR5002. Retrieved April 14, 2008. Gross, P. M. 2007a. Scientists zero in on health benefits of berry pigments. NPI Center. Retrieved April 14, 2008. Gross, P. M. 2007b. Superfruits take center stage: Defining an emergent category. NPI Center. Retrieved April 14, 2008. Joseph, J. A., B. Shukitt-Hale, N. A. Denisova, D. Bielinksi, A. Martin, J. J. McEwen, and P. C. Bickford. 1999. Reversals of age-related declines in neuronal signal transduction, cognitive, and motor behavioral deficits with blueberry, spinach, or strawberry dietary supplementation. Journal of Neuroscience 19(18): 8114–8121. Kalea, A. Z., F. N. Lamari, A. D. Theocharis, P. Cordopatis, D. A. Schuschke, N. K. Karamanos, and D. J. Klimis-Zacas. 2006. Wild blueberry (Vaccinium angustifolium) consumption affects the composition and structure of glycosaminoglycans in Sprague-Dawley rat aorta. J Nutr Biochem. 17(2): 109-116. Kalt, W., D. A. Ryan, J. C. Duy, R. L. Prior, M. K. Ehlenfeldt, S. P. Vander Kloet. 2001. Interspecific variation in anthocyanins, phenolics, and antioxidant capacity among genotypes of highbush and lowbush blueberries (Vaccinium section cyanococcus spp.. J Agric Food Chem. 49(10): 4761-4767. Matchett, M. D., S. L. MacKinnon, M. I. Sweeney, K. T. Gottschall-Pass, and R. A. Hurta. 2005. Blueberry flavonoids inhibit matrix metalloproteinase activity in DU145 human prostate cancer cells. Biochemistry and Cell Biology 83(5): 637-43. National Cancer Institute (NCI). 2004. Antioxidants and cancer prevention: Fact sheet. National Cancer Institute. Retrieved April 14, 2008. Nauman, W. D. 1993. Overview of the Vaccinium industry in Western Europe. Fifth International Symposium on Vaccinium Culture (published on the Web site of the International Society for Horticultural Science). Retrieved April 14, 2008. Neto, C. C. 2007. Cranberry and blueberry: evidence for protective effects against cancer and vascular diseases. Mol Nutr Food Res. 51(6): 652-64. New Jersey Department of Environmental Protection (NJDEP), Division of Parks and Forestry. n.d. Elizabeth C. White. Whitesbog Village, hosted by Burlington Country Library. Retrieved April 14, 2008. Nutrition data. n.d. [http://www.nutritiondata.com/facts-C00001-01c20Tt.html Nutrition facts and information for blueberries, frozen, unsweetened. NutritionData.com. Retrieved April 14, 2008. San Jose Farms (SJF). n.d. Products: Blueberries. Sn Jose Farms. Retrieved April 14, 2008. Schmidt, B. M., J. W. Erdman, and M. A. Lila. 2006. Differential effects of blueberry proanthocyanidins on androgen sensitive and insensitive human prostate cancer cell lines. Cancer Lett. 231(2):240-6. Retrieved April 14, 2008. Seeram, N. P., L. S. Adams, Y. Zhang, R. Lee, D. Sand, H. S. Scheuller, and D. Heber. 2006. Blackberry, black raspberry, blueberry, cranberry, red raspberry, and strawberry extracts inhibit growth and stimulate apoptosis of human cancer cells in vitro. J Agric Food Chem. 54(25): 9329-39. Retrieved April 14, 2008. Srivastava, A., C. C. Akoh, J. Fischer, and G. Krewer. 2007. Effect of anthocyanin fractions from selected cultivars of Georgia-grown blueberries on apoptosis and phase II enzymes. J Agric Food Chem. 55(8): 3180-5. Retrieved April 14, 2008. Starling, S. 2007. Superfruits: Superheroes of functionality. Functional Ingredients Magazine April 2007. Retrieved April 14, 2008. Stubbs, C. S., and F. A. Drummond. n. d. Conserving native pollinators of blueberry: A case study. Food and Agriculture Organization (FAO). Retrieved April 14, 2008. Sumner, J. 2004. American Household Botany: A History of Useful Plants, 1620-1900. Portland, Ore: Timber Press. ISBN 0881926523. Sweeney, M. E., W. Kalt, S. L. MacKinnon, J. Ashby, and K. T. Gottschall-Pass. 2002. Feeding rats diets enriched in lowbush blueberries for six weeks decreases ischemia-induced brain damage. Nutr Neurosci. 5(6):427-31. Retrieved April 14, 2008. US Highbush Blueberry Council (USHBC). 2002. The highbush blueberry. US Highbush Blueberry Council. Retrieved April 14, 2008. Wang, Y., C. F. Chang, J. Chou, H. L. Chen, X. Deng, B. K. Harvey, J. L. Cadet, and P. C. Bickford. 2005. Dietary supplementation with blueberries, spinach, or spirulina reduces ischemic brain damage. Exp Neurol. 193(1): 75-84. Retrieved April 14, 2008. Yi, W., J. Fischer, G. Krewer, and C. C. Akoh. 2005. Phenolic compounds from blueberries can inhibit colon cancer cell proliferation and induce apoptosis. J Agric Food Chem. 53(18): 7320-9. Retrieved April 14, 2008. Wild blueberry. University of Maine Cooperative Extension wild blueberry site. This page was last modified on 14 June 2016, at 15:33.